Hamas signals to Israel that it is not responsible for rocket attack on southern Israel. Security officials not buying it. Hamas has signaled to Israel that it is not responsible for Thursday evening’s rocket attack on southern Israel and that it is working to find and arrest the shooters, Channel 10 News reports. A senior security official said, however, that Israel views Hamas as being responsible for the attack. 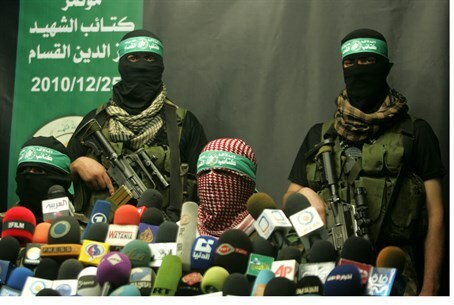 "We see Hamas as responsible, and expect it to enforce order in Gaza. Hamas is the ruling power in the region and is must maintain quiet; if not it will be held responsible. We will not accept a trickling of rocket fire,” the official said. At least one terrorist rocket was fired from Gaza at southern Israel on Thursday evening, according to the IDF. There were no reports of physical injuries or damage. The remains of one rocket were located in an open area in the Sha'ar Hanegev region. The IDF later retaliated by launching an airstrike which targeted what was described as a “terrorist infrastructure” in northern Gaza. “The IDF will not permit any attempt to harm the security of the citizens of Israel,” the statement said. The last time a Color Red siren was heard in the Gaza Belt region was in late December – four months ago. In response, IAF jets attacked Hamas training grounds in Khan Yunis, in southern Gaza.